Homemade cashew based vegan butter – learn to make your very own dairy free butter using presoaked cashew nuts, yes it’s that simple. If I told you that butter can be made without soya and palm oil, would you believe me? Well that’s actually what this recipe has proven. I discovered I was lactose intolerance a few years ago after suffering from the adverse effects of consuming large amounts of yoghurt. What that means is my body cannot digest the nature occurring sugars in cows milk. Lactose intolerance can lead to gas, bloating, crippling stomach pains and diarrhoea just to name a few side effects and believe me it is no walk in the park. Although, I can eat the odd chocolate made from dairy but large amounts of ice cream? you’re kidding me. Since discovering this I’ve made it my mission to cut down on dairy products, although I am guilty of eating the occasional piece of chocolate, aside from that I don’t indulge in dairy produce (not that I can think of). I’ve thought about trying goat cheese but the verdicts still out about that. Once you eliminate something or at least most dairy from your life, you begin to grow accustom to doing without. However, I longed for some butter – butter that was dairy free, free from soya, palm oil without any synthetic vitamin additives. Where would I find such a thing? does it even exist? 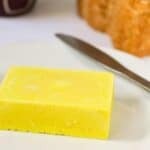 A few years ago I scoured the internet for a decent vegan butter recipe. I stumbled on Mattie from veganbaking.net where he show cased a groundbreaking recipe, sadly it was made with soya milk. 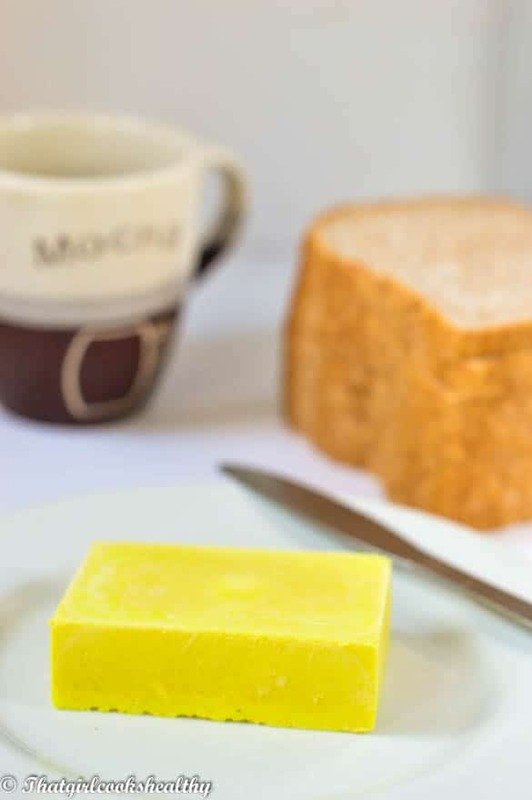 I’ve never tried making my own butter before, so I decided to try his recipe. The results were impressive to say the least and foolproof, so if you’re not concerned about soya I would definitely recommend heading over there and trying it out. 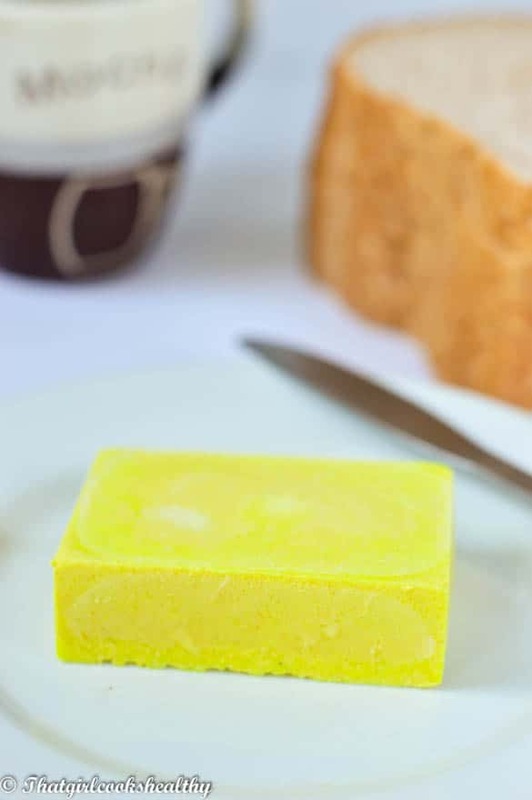 Finally I found a recipe from a woman called Rhea who made vegan butter that was cashew based (click the link). I was overjoyed and immediately gathered the ingredients together to make my own version; turmeric for colour, himalayan pink salt, water, raw organic apple cidar, coconut milk, olive and a pinch of xanthan gum and this non gmo sunflower lecithin granules made from sunflower seeds. FYI – I’ve made this butter several times now and found it has an extremely short shelf life (week or so). Perhaps this is cue in part to the cashew puree being raw and unpasteurised. Nonetheless, storage wise keep it in the freezer and thaw out – use and refreeze. I’ve been doing this with no problems, plus reduces the chances of leaving a batch in the fridge and having to waste money by tossing out the whole thing. 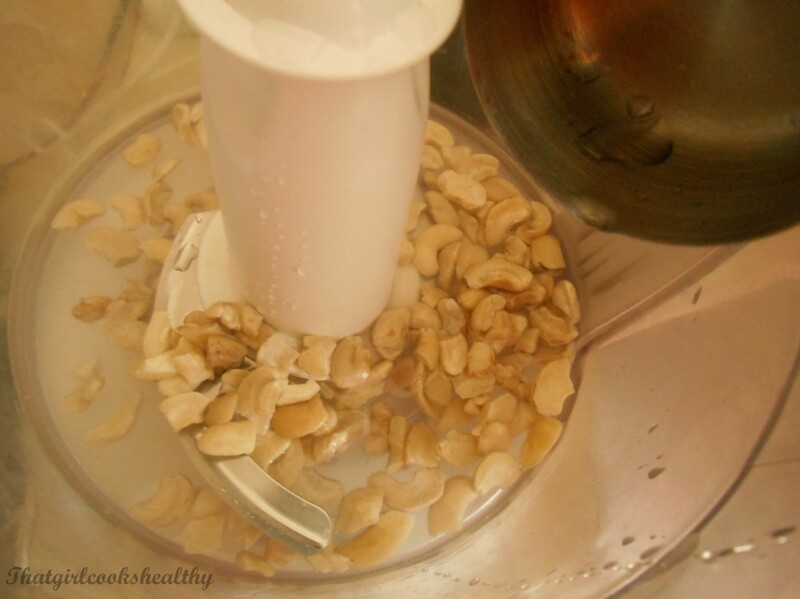 Pulse the cashew in a blender or food processor – if possible try to pre soak them in luke warm water overnight. This will yield a creamy puree consistency. This is the finale stage of the homemade cashew butter where all the ingredients were whipped together. I poured the mixture into a silicon mould and froze it. Start off by pulsing the cashew nuts with warm water until a creamy consistency begins to form. Once the creaminess has formed, transfer the nut puree into a small bowl with the apple cider vinegar and set aside for 10-15 minutes. 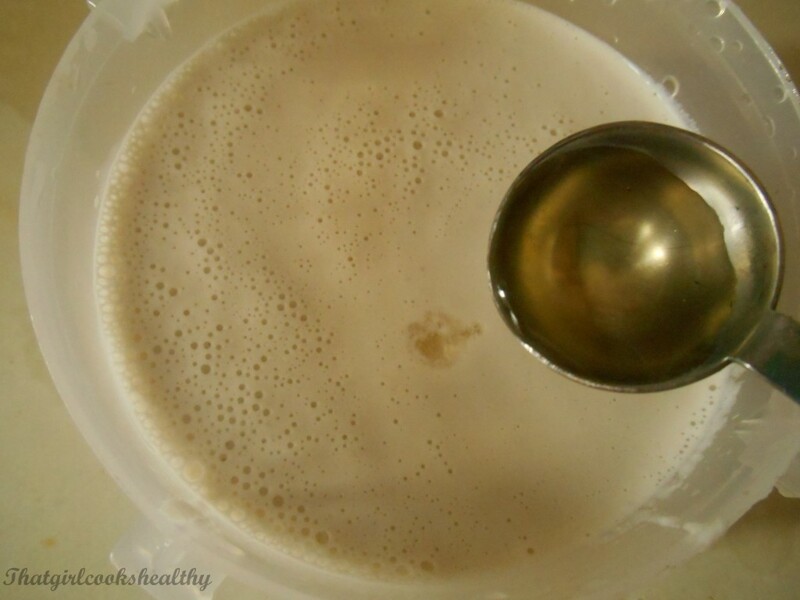 After a few minutes the mixture should congeal and thicken up. The next step includes the melted coconut oil, if it hardens, melt again in a bowl surrounded by some warm water. Add of the ingredients into a blender or food processor. If using a blentec or vitamix 45 seconds should suffice. A food processor – blend for roughly 2 minutes. Once finished add the smooth, runny liquid to a mould or ice cube tray and freeze for 1 hour or so. I stored mine in the freezer, so left it there until use (recommended). 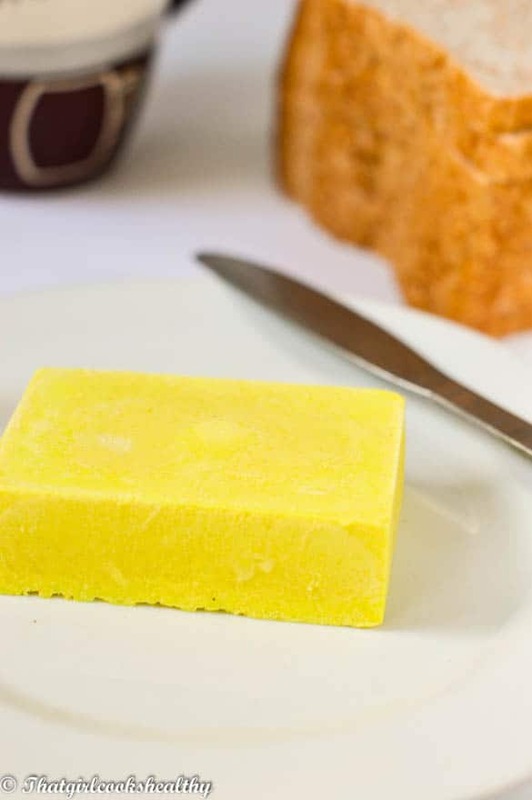 Butter has a very shelf life (a week or so maximum) I advise to retain butter in freezer, thaw and use accordingly or set butter in small mould for ease. Hey Val, that’s such a funny situation and one that happens all too often in my home. Like you I find this complimentary unless I’m hungry, it’s not so fun then. Glad you liked the recipe, be sure to store the butter in the freezer and use as you go along. I’ve been using a few batches for a few months now and I simply let it soften, use and refreeze with no problem. No way to make this without the lecithin? No, I have tried, it’s needed as a binder.